Taken in 2014 for a FotoRiesel photography competition in Sydney. Photo itself pictures the Sydney skyline and Darling Harbour – the Wildlife Museum and Madame Tussaud’s. Background is viewed through the cross-hatches of a footbridge. What do you look for in a photo? In art? In the world? I look for a piece of me. A reflection of where I’ve been. A connection to between my life and what’s happening around me. Tell me, what do you look for? I took these photos (and a slew more) on Friday night in the heart of Sydney, Australia. It was a beautiful night filled with the famous lights of the Vivid Sydney Festival (learn more here). 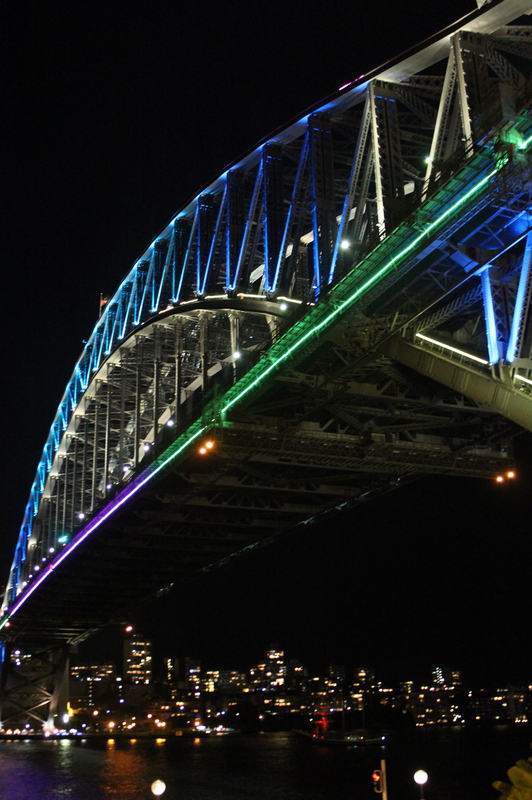 The buildings, structures and sculptures along the Sydney Harbour waterfront were lit to please. And they did. This is what date night looked like for hundreds of us in Sydney the last few weeks. This is what I look for in art–emotion, connection and life.